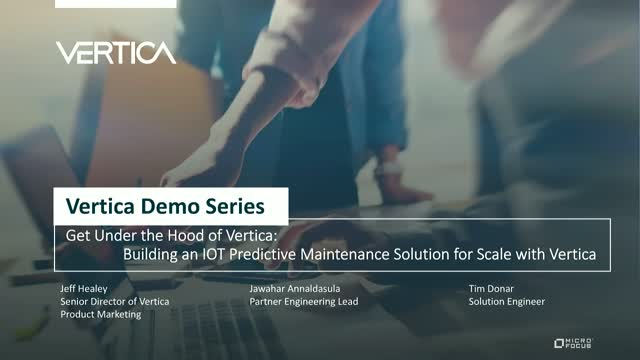 In the next webinar of our "Under the Hood" series, see why more intelligent device manufacturers are turning to the Vertica Advanced Analytics Platform to manage and analyze large volumes of sensor and time-series data from the Internet of Things for predictive maintenance solutions. Join us as we preview a predictive maintenance demonstration that shows how Vertica core technology and in-database Machine Learning enables equipment manufacturers to accurately pinpoint maintenance issues before they occur, unlocking new value in the form of service cost reductions, reduced downtime, and more. Did you know that you can provision, manage, and monitor multiple Vertica clusters, all from a single, unified console? DBAs rely on the Vertica Management Console to optimally manage Vertica resources, ensuring data engineers and data analysts experience the performance they require as they derive insight from growing data volumes. Join us to learn the top four use cases for the Vertica Management Console. Specifically, you will learn how the Vertica Management Console can enable your organization to effectively manage system resources across all your users to deliver optimal query performance, understand query optimization paths and resource usage, plan and triage queries by looking at historical system data, and receive timely alerts to keep Vertica running optimally. Simpli.fi is a leading programmatic advertiser trusted by the largest ad buyers to localize ad targeting and content, deliver performance on high volumes of localized campaigns, and provide deep insights on their dynamic audiences. To deliver these insights, Simpli.fi developed a data analytics platform capable of handling hundreds of millions, to billions of bid messages streaming in each hour and transforming that data into timely, dynamic information available through their customer application. In today’s competitive content services space (including music, OTT, eBooks and other licensed content), traditional telcos, content owners and content distributors must compete with the likes of Netflix, Amazon, Facebook and other new economy companies to attract and retain customers. Join our latest Data Disruptors webcast to hear how Catch Media is helping traditional players drive revenue and gain deep customer insights so they can compete in the new world of cord-cutting and over the top and digital content technologies. Yaacov Ben-Yaacov, CEO of Catch Media, will show how his company enables content owners and distributors to achieve 50%+ increase in engagement through the segmentation of end consumers into distinct audiences that can be targeted in near real-time with messaging and recommendations personalized to their content consumption behavior. If you’re like most of our customers, your data pipeline includes custom analytic functions and data loaders written in C++, R, Python, and other languages. It’s important that your analytical database is extensible enough to ensure that you can leverage those functions and loaders. Join us for this Webcast to learn how Vertica has a highly extensible User-Defined Extension (UDx) framework that allows you to develop your own analytical or data loading tools within Vertica, including new types of data analysis and the ability to parse and load new types of data. As a result, routines written in C++, R, Java or Python can be run in-database as Vertica SQL functions, increasing the power and flexibility of procedural code by bringing it closer to the data. Learn all about the range of available Vertica UDXs, common use cases, and even how to write user-defined scalar and parser functions. In today’s data-driven world, creating a competitive advantage depends on your ability to transform massive volumes of data into meaningful insights. Companies that use advanced analytics and machine learning are twice as likely to be top quartile financial performers, and three times more likely to execute effective decisions. Built into Vertica’s core — with no need to download and install separate packages — in-database machine learning transforms the way data scientists and analysts across industries interact with data; removing barriers and accelerating time to value on predictive analytics projects. This webinar takes you through the journey around the usual data science process, pitfalls attached, how Vertica addresses the same, what is included, short examples and most importantly some successful real-life use-cases with customers from different domains. If time permits, we will also try include a quick demonstration. Join us to hear how easy data-science is using Vertica & SQL and how to deliver predictive analytics effectively & quickly. Medical imaging systems such as MRI and CT scanners must provide optimal clinical performance and predictable cost of ownership. While clinicians understand the need for maintenance, any system downtime can be costly for health service providers. To overcome this challenge, Philips Healthcare is moving from reactive to data-driven, proactive maintenance, utilizing new sources of sensor data along with machine learning models to enable scheduled, predictable and non-intrusive service actions that don’t interrupt regular clinical workflow. There are two popular ways that organizations mine growing volumes of data for insight: short-term dashboard reporting and long-term analytics. Every organization would like their dashboards on recent data to be faster in addition to keeping data longer so that data analytics can derive more insightful, granular results. Join us for this Webcast to understand how Vertica can help you achieve both of these goals with these powerful features – Hierarchical Partitioning, Flattened Tables, and Live Aggregate Projections. Discover how Hierarchical Partitioning combines old data partitions into larger files, allowing you to retain more data without bloating the catalog or forcing partitions to be less fine-grained. The former benefits data analytics, while the latter helps with dashboard reporting, as more fine-grained partitions help with pruning data more aggressively, resulting in faster query performance and less resource usage. You’ll also learn how Flattened Tables provides convenient and faster data denormalization for your dashboard queries and optimizes resources more efficiently by avoiding joins. The unique column-wise refresh mechanism can defer denormalization operation after your ETL process without introducing much overhead. Finally, learn how Live Aggregate Projections materializes partially aggregated results to speed up those aggregation-type analytical queries. Barnes-Jewish Hospital’s mission is to take exceptional care of people by providing world-class health care in a compassionate, respectful and responsive way. To support this mission, the Data Management Team at Barnes-Jewish took on the transformative task of enabling data-driven operations and business decisions at all levels of healthcare delivery. Succeeding in this ambitious project required not only the right strategies and technologies, but a journey of transformation, knowledge acquisition and growth. If you use Vertica, you already know that it’s a high-performance MPP analytical database. But, did you know that Vertica is also a highly performant query engine? Join us for this Webcast to learn how Vertica for SQL on Hadoop offers the fastest and most enterprise-ready way to perform SQL queries on your Hadoop data. We’ve leveraged our years of experience in Big Data analytics and opened up our platform to use the full power of the Hadoop cluster. In this webcast, you’ll learn to take advantage of our open source contributions to the Apache community, ORC and Parquet file readers/writers, and various connectors and features to accelerate the exploration of your growing data lakes. Join us to learn all about the latest features now available in Vertica 9.2. If you have variable, business-critical analytical workloads, you’ll want to hear how Vertica in Eon Mode now includes database branching for creating instant Vertica clones for scaling throughput and backup and recovery functionality for 24x7 data protection. Your data engineers will be interested in Vertica 9.2’s new Machine Learning functionality to create workflows involving multiple machine learning algorithms with similar data types. And, with support for our new open source Python Vertica client, your developers and data scientists will learn how they can now run SQL queries, perform advanced analytics, and load data into Vertica, all from within the confines of their Python code. Join us to learn more about Vertica’s new Eon Mode – the power of separating Compute and Storage. You will walk away with an appreciation for how Vertica can run in the Amazon cloud, meeting your technical, operational, and financial goals as well as a deep understanding of fundamental Eon Mode concepts. With Vertica 9.1, Vertica in Eon mode is out of beta and generally available as the Vertica Cloud Solution on AWS. We will cover core Vertica in Eon Mode concepts, including sharding, subscriptions, caching, sharing and reviving a cluster from S3 and present new features added since the beta release. Finally, we highlight Eon Mode’s key features through the presentation of a specific use case. The Climate Corporation aims to help the world's farmers sustainably increase their productivity with digital tools. The integrated Climate FieldView™ digital agriculture platform provides farmers with one comprehensive, connected suite of digital tools to help them optimize resources and maximize yield. Building the digital tools to support this mission requires processing and analyzing petabytes of diverse datasets. Everything from satellite imagery and weather data, to sensor data from on-farm equipment and clickstream data must be ingested and made available for analytics. Can you protect personal data in analytical databases, while increasing data access, and enabling compliance with GDPR and other data privacy regulations? In this session, you will learn how Voltage SecureData for Vertica, a data-centric security offering that puts the control on the analytics data using format preserving encryption, enables trusted big data to move between untrusted environments. As a result, this combined solution allows data protection to persist as the data moves from storage to in-flight to in-use within applications without requiring changes to downstream applications. Join the latest webcast in our Data Disruptors Series to see how Namara - a data management platform - uses collaboration and role management as fundamental pillars to give businesses greater visibility over structured data across multiple data silos, as well as access to the wider world of public open data. We live in an increasingly connected world – from cloud software and data center hardware to medical devices, industrial machines, and consumer wearables. Whatever can be connected, will be connected. Why? Because vendors (manufacturers) seek to tap the telemetry data from these connected products to improve their customer experience. Two distinct trends are converging. The cloud is proving immensely useful in providing elastic, measurable, on-demand and self-service resources to organizations of all sizes. The uptake in 2018 has been phenomenal, continuing the biggest transformation that technology professionals will experience in their careers. Also, all organizations are relying even more than before on analytical databases to load, store, and analyze volumes of data at high speed to derive timely insights. An independent benchmark study was conducted to assess query performance, concurrency impact and cost-effectiveness of Vertica and Snowflake running in the AWS Cloud. The benchmark (expanding upon UC Berkeley’s Big Data Benchmark) simulated scenarios to answer fundamental business questions that every enterprise might encounter and ask. In this webinar, we will discuss the very interesting, need-to-know results and key takeaways of the benchmark. We will also discuss how to achieve high-performance and scalable analytics in the cloud and augment current, on-premises platforms in a cost-effective manner, continuing your journey to being data-driven. Join this webinar to understand how to expand and enhance your Python analytics with Vertica. Vertica’s built in integration with Python allows for more data and deeper analytics. As a very efficient database for massive amounts of data, Vertica’s optimizations and advanced analytics can help you achieve new heights as a Python programmer. Join the latest webcast in our Data Disruptors Series to hear how Nimble Storage leverages flash storage and predictive analytics to deliver advanced customer insights and 99.9999% availability. The company’s InfoSight customer platform eliminates headaches and wasted time by transforming how storage is managed and supported, analyzing millions of sensors every second to prevent problems. Vertica Eon Mode Beta, a separation of compute and storage architecture option, addresses the common need to rapidly scale your cluster to variable workloads. It also accommodates an almost endless data warehousing capability. Join us as we preview the benefits of this new architecture and walk through a step-by-step demonstration of its capabilities. The Vertica Analytics Platform is built to handle the most demanding analytic use cases and is trusted by thousands of leading data-driven enterprises around the world, including AT&T, Etsy, Bank of America, Intuit, Uber and more. Vertica delivers speed, scale and reliability on mission-critical analytics at a lower total cost of ownership than legacy systems. All based on the same powerful, unified architecture, the Vertica Analytics Platform provides you with the broadest range of deployment models, so that you have complete choice as your analytical needs evolve. Deploy Vertica on-premise, in the clouds (AWS, Azure and GCP), on Apache Hadoop, or as a hybrid model. Find more information on Vertica at www.vertica.com.